The image-makers of Las Vegas, especially the folks who coined the now-famous “What Happens Here, Stays Here” slogan, are terrific at selling this town. That’s one reason the local airport serves nearly 1 million passengers every single week in an area that has only two million residents. But here’s one thing the Las Vegas publicists don’t talk about: Las Vegas scorpions. Search the official websites of the Las Vegas Convention and Visitors Authority, which owns the aforementioned slogan, for the word “scorpion” in a pest context, and you’ll come up with zip. For me, this really hit home in home a couple weeks ago when a scorpion crawling across the ceiling actually fell into my own bed! Fortunately, I’m a light sleeper and was able to make short work of it with a pillow case organized-crime-style (hey, this is Vegas, baby, where the Mob Museum is a popular tourist attraction). I was careful to avoid the tail, tipped with a stinger that can swoop over and deliver a hefty load of potent venom. An autopsy (by me) revealed it was an Arizona bark scorpion similar to the one in the picture accompanying this post. The brownish creatures are so called because they live on the bark of palm trees, which are plentiful in Las Vegas, and were first identified in our neighboring state. 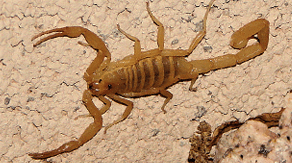 Arizona bark scorpions are rather small, usually three inches or less in length, including the tail. But they more than make up for their diminutive stature with a toxin routinely called among the strongest in the scorpion world. It is said that there are two dozen kinds of scorpions around Las Vegas, but only the Arizona bark scorpion can deliver a sting described as potentially fatal. I say potentially because I really can’t find a record of anyone succumbing to an Arizona bark scorpion sting in Las Vegas, Nevada or even the rest of the country. And that includes Arizona. But I have neighbors and other acquaintances in Las Vegas who have been stung by bark scorpions, and they affirm it hurt like hell for a couple days. But few victims, it appears, go to emergency rooms for treatment unless they are infants or very old folks. I live on the southeast side of the Las Vegas Valley just off U.S. 93, which is now the main direct truck route between Arizona and the Las Vegas area. I’m guessing the critters hitched rides and then fell off once they got past the Hoover Dam on the state line just 30 miles away. So it’s maybe not surprising they’re around me. But Arizona bark scorpions also can be found across the Las Vegas Valley, where they started to be noticed maybe a decade ago. U.S. 93 and U.S. 95, another old truck route starting in Arizona, cut across Las Vegas on the same roadway before separating, providing lots of local dropping-off points. The scorpion that fell into my bed was the second live one I found inside the house. The first was in the bottom of a cardboard moving box I was unpacking last summer after becoming New To Las Vegas. The big moving truck came from Seattle–not a known breeding ground of Arizona bark scorpions–but parked for a day in Las Vegas because it beat me here. I’m guessing the scorpion jumped on and made its way into my box of old computer cables. Nothing to eat or drink in there, but cozy. I used my boot to deliver the coup de grâce. Actually, Arizona bark scorpions are not very aggressive unless they’re trying to find bugs, which is a good thing since they eat many times their weight in beetles, roaches and, sometimes, other scorpions. Their eyesight is said to be dreadful. Arizona bark scorpions only attack humans when threatened–by, say, a foot trying to get into a shoe where they had holed up for the night. Hell, they wouldn’t even need Oscar Goodman, the mob lawyer turned ex-Las Vegas mayor, to get them off on a stand-your-ground plea. Arizona bark scorpions are covered with a waxy substance that both retains their precious bodily fluids against the dry desert heat and helps make it possible for them to slip through cracks narrower than a credit card’s thickness. There are a number of home remedies for dealing with scorpions other than putting down poison, which can be a problem with pets. An interesting one I heard about involves wetting a burlap bag and putting it in the middle of a room or a porch before going to bed. It attracts scorpions looking for moisture. In the morning, the homeowner simply steps on the bag. Nobody said scorpions are bright (even though they’ve been around for a couple hundred million years). Another way to rid a property of Arizona bark scorpions is to get chickens. Yes! They apparently view scorpions as akin to munchable potato chips. Within a few blocks of my house I have seen chickens and roosters running loose on the streets. That’s made me wonder if they’re in the ‘hood for the purpose of centruroides sculpturatus-control (the scientific name for an Arizona bark scorpion, in case you make it to a TV game show or the national spelling bee). Speaking of TV, every so often, a Las Vegas station airs a scorpions-running-amok-in-Las-Vegas story. For a particularly alarmist YouTube example from just last year on KTNV, the ABC affiliate, click now. This is definitely one clip the Las Vegas flacks wished didn’t happen here.